There are myriad ways to cook cauliflower–steaming, roasting, and stir-frying being some of the most common. This recipe for baked cauliflower puffs is an interesting twist on cauliflower that is so tasty, even cauliflower haters might be won over! 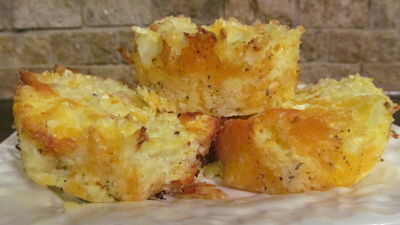 The cheese in these puffs could be varied to make several versions of this recipe. This sharp cheddar is a perfect choice and very kid friendly. The next time I make these, I want to try Gruyere and fresh parmesan to see if the puffs taste similar my family’s favorite gourmet Gruyere cheese grits. These freeze well and can be reheated in the microwave or oven. The microwave will yield a softer puff, so I microwave until thawed and finish in the oven to get the outside crispy. Preheat oven to 400 degrees, and spray a 12-cup muffin pan with cooking spray. In food processor, shred cauliflower until fine. Squeeze cauliflower with a clean towel until all water is removed. In medium sized bowl, mix cauliflower, eggs, cheddar, sea salt, ground pepper, and garlic salt. Press mixture firmly into muffin cups. Bake at 400 until very golden and crispy on the outside, 35-40 minutes. Note: The first time that I made these, they were difficult to remove from my old muffin pan that had seen its better days. The cheese stuck to the pan and made the puffs nearly impossible to remove intact. After doing a bit of research, I decided to buy this muffin pan based on myriad rave reviews on amazon. I’ve used it several times, and it is FABULOUS–food comes out easily and cleanup is a breeze.